Keep organized with White #5 Coin Envelopes. If you have small coins or trinkets that need storing then these #5 Coin Envelopes are a must have. Jewelry companies and pawn shops use 2 7/8 x 5 1/4 White Envelopes for storing and sending watches, jewels, rings earrings and many other small items. 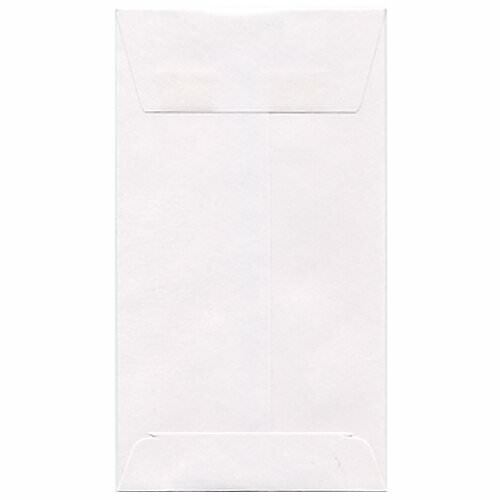 If you are in a business where you frequently receive tips, these envelopes are a great way to store your earnings before totaling them at the end of the day. Doctors and dentists use these envelopes to store teeth, rubber bands, batteries or samples. Can you say versatile or what? The white color makes these simple to label, easy to read, and will compliment anything you decide to put inside. White 2.875 x 5.25 Envelopes ship in quantities of 25. Need a ton? You can save some money when you buy a box of 1000! And once you see how high quality this envelope is, you're going to want a million ... trust us on that one.